There are two options: install using pip or manually download the SDK. Note although the demo program has a dependency on TkInter, the core Python OCR API doesn’t. After the UI lauches, you might be asked to perform a one time data library download. 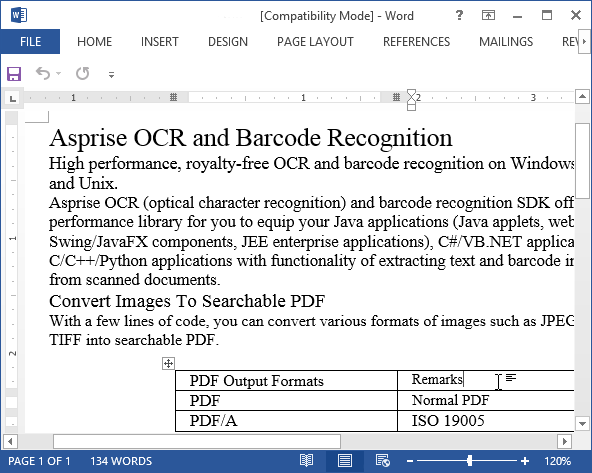 Later sections will introduce how to invoke the OCR API without the UI. 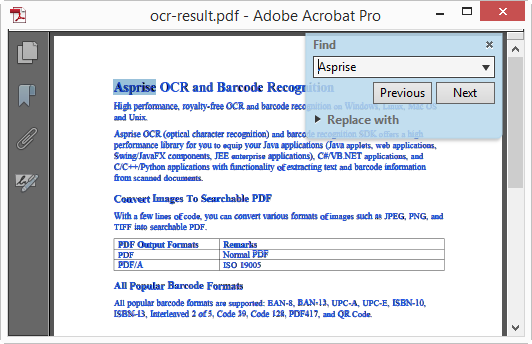 Download a copy of Asprise OCR SDK from http://www.asprise.com/product/ocr. Unzip it and that’s all. After unzipping the package, run the commands to launch the OCR demo program. Line 1: Imports the Ocr class and constants. 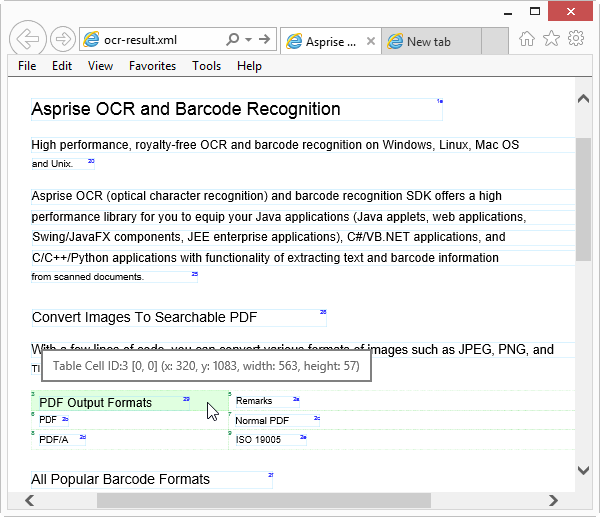 Line 4 and 5: Creates a new Ocr engine and starts it for recognizing English. The evaluation version is able to recognize English (eng), Spanish (spa), Portuguese (por), German (deu) and French (fra). For other languages, please contact us. The list of languages supported can be found Languages Supported. Line 6: All the OCR work is done here. 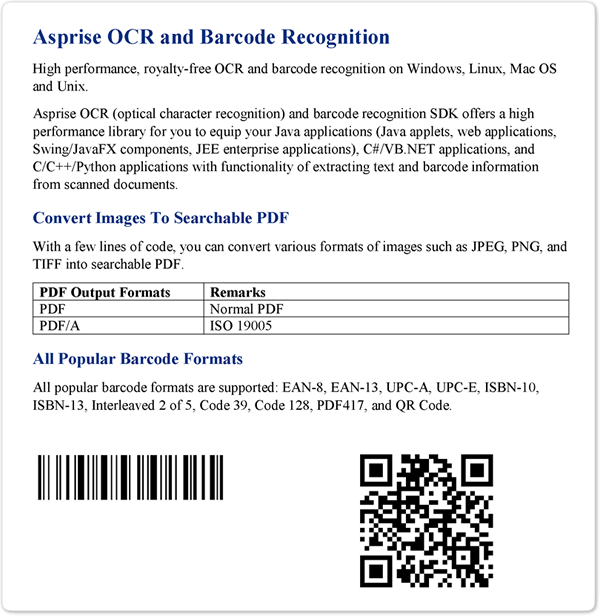 The recognizeAll method of the com.asprise.util.ocr.OCR class recognizes all the characters and barcodes from the image and output them as a string. The output format is set as plain text. Other supported formats are: XML (Ocr.OUTPUT_FORMAT_XML), searchable PDF (Ocr.OUTPUT_FORMAT_PDF) and user editable RTF (Ocr.OUTPUT_FORMAT_RTF). In above code, properties are specified using keyword arguments. To make the text invisible or transparent, you simply set PROP_PDF_OUTPUT_TEXT_VISIBLE to False. Both normal PDF and PDF/A are supported. Please refer to the options guide. Most of modern computers run on multi-core CPUs. Multi-threading can significantly reduce the runtime by making full use of the processor power. You may take advantage of Python’s threading package. Note that each thread must have its own dedicated OCR engine instance.